Ever struggle to really get into your work? Maybe you feel uninterested, distracted, or struggle to stay on task. I can relate. I also used to feel completely drained of all my energy after I’d get done working. The only thing I wanted to do afterwards was sit on the couch and watch TV. You can feel stuck like this in a job, but if you aren't careful, you can end up accidentally crafting a business that leaves you with a job description that you, well, hate. On the flip side, you have opportunity to create your dream job. So, how do you make sure you LOVE the day to day of your business instead of dread it? Let's first dig into the cause of this. 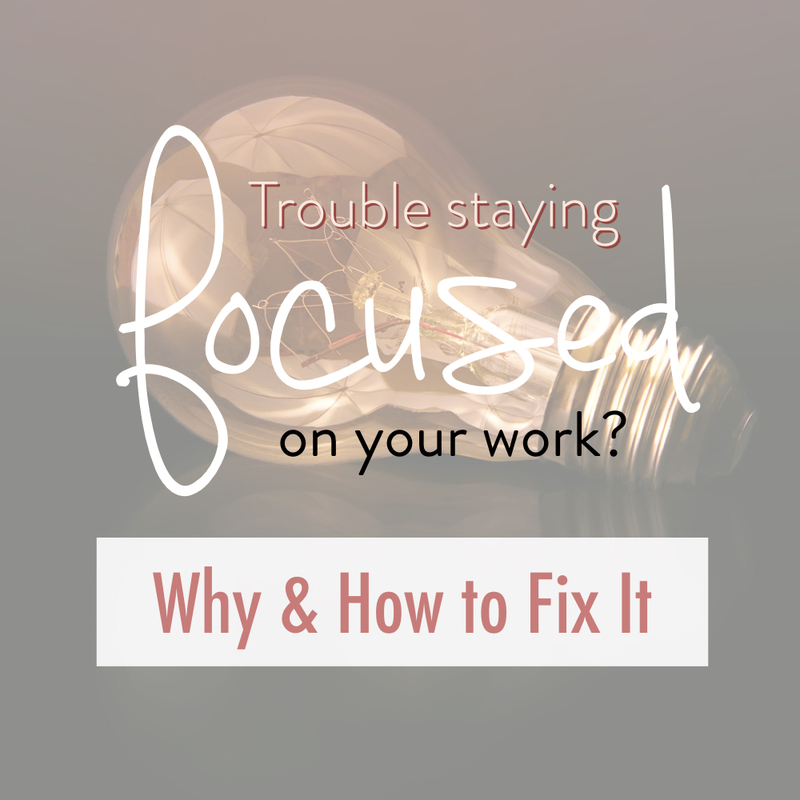 If your work drains your energy or you struggle to really feel engaged with what you’re doing, it could be because you’re not doing the right type of work or working in a way that you really thrive. I’m a huge believer in crafting a business that you love - a business that also allows you to love your life. I believe the best way to do this is to find your sweet spot. Your sweet spot is where your unique skills are applied to things you care about in a way that fits with what you want in life. A big piece of this that many entrepreneurs aren’t very intentional about is to work in a way you enjoy and operate best. Even thought this is often overlooked, it can be the difference between being happy with your work and creating a successful business and, well, not. Do you ever have those moments where you’re in flow? You feel like you’re in the zone and time flies. You know you’re doing great work and feel so energized afterwards. Who wouldn’t want their work to feel like this all the time? Okay maybe it’s not possible to feel that way 100% of the time, but there is a way to feel it a much higher percentage of the the time than you are likely feeling now. When you operate in this zone you not only feel better and feel more satisfaction, but you’re also going to do better work. If you can figure out what those awesome work moments have in common, you can craft your business to center around those things. One of the books I recommend to people most is Designing your Life by Bill Burnett and Dave Evans. It really helped me figure some of this stuff out for myself. One of the exercises the book recommends is called a Good Time Journal. It’s essentially a reflection activity where you write down all the specific things you do over the course of a week or more. For each activity, you’ll rate both your energy and engagement. For energy, something may drain your energy, give you energy, or somewhere in between. For engagement, you may be very engaged in what you’re doing and maybe even getting into flow, or not engaged at all. Once you’ve collected enough data, you’ll want to look at patterns. What do the highly rated thing have in common? These will be indicators of what’s needed for you to really enjoy what you’re doing and thrive in it. You will likely also find patterns with the things that you’ve rated low. These are things you’ll want to find ways to do less of. You can search for patterns within the acronym AEIOU. How well defined was it? What type of place were you in? What was the vibe or the setup? Was it crowded or did you have solitude? Was it familiar or new? What type of interaction was it (for example formal or casual)? Who were you interacting with? How was the interaction taking place? Were they aiding you in your work or were you creating the object? Were they your peers, superiors, subordinates, collaborators, clients suppliers, etc.? Once you’ve identified patterns of things that get you energized and engaged you can start your business or shift your business to focus on these things and avoid the things that have the opposite effect. For example, if you prefer to work alone, don’t start a business with a business partner and don’t start a business centered around engaging with clients. If you get jazzed up by whiteboards like I do, integrate the use of them into your work process with clients (yep, you guessed it, I do that). If you hate staring at a computer screen, don’t start an online business. If you love working with crafts, consider a business that integrates creative, hands-on work into it. If you’re a solopreneur, of course there are always going to be things that you don’t like to do that have to get done. That being said, you can structure your work to minimize those things and build a team to delegate to (for example, a virtual assistant). Ready to take control of what your day to day work looks like and craft it into your dream job? Download this free guide to figure out what energizes and engages you. Yay! Can't wait to help you figure out what kind of work energizes and engages you the most! Check your email to download your free Energy & Engagement Journal. I’m Stacy, an entrepreneur, strategist, and adventurer dedicated to helping entrepreneurs build their dream business and live their ideal life.